Leading off today: A post-game brawl erupted at Wyandanch High School on Monday night shortly after a boys basketball victory over Mount Sinai. Brawlers threw at least four chairs and others wrestled each other to the ground or shoved and pushed, Newsday reported. Suffolk County police reported the arrest of a 14-year-old male for hitting an officer. A 14-year-old girl, who was not involved in the fight, suffered a knee injury and was treated at a hospital. Numerous 911 callers reported a fight in the gym about 5:45 p.m. The first officers to arrive saw 15 to 20 people fighting, but the origin of the fight was unclear. The paper reported a video showed a circle of about 40 people around fighters on the court, with more spectators milling about on the sidelines and bleachers. "The brawl occurred right after the game," Mount Sinai AD Scott Reh said. "According to my coaches, the melee did not involve Mount Sinai players or fans. Our coaches did a great job of getting our student-athletes out of the area and to a safe place in an adjacent hallway and locker room. I was told it turned into a hostile environment very quickly." Section 11 Executive Director Tom Combs said he will meet with the county's boys basketball chairman and security people to determine what to do about the incident. 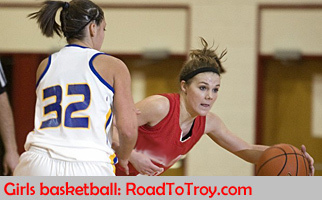 Girls basketball: There were two notable developments out of Section 5 on Monday. Rochester Edison senior Dyaisha Fair scored a school-record 51 points and added 14 rebounds, eight assists and eight steals during a 75-66 win over Gates Chili. Midlakes, ranked No. 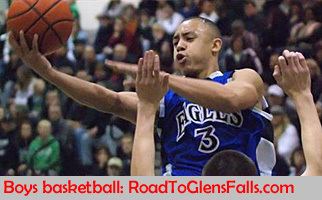 1 in the state in Class B, suffered an 89-66 loss to Class AA Our Lady of Mercy. The Monarchs got 21 points from Emily Tabone, 20 by Katie Whitaker and 19 from Maggie McDonough. Screw it. How can I not comment? Shooing teams from the ice midway through the third period of a competitive game ranks as the Mickey Mouse move of the year in New York high school sports -- never a small feat. I'd rather play my games on the Hudson River -- it wouldn't even have to be thoroughly frozen over -- than at a rink operated by people that inflexible. Hop, skip and jump into the books: Com- mack's Alissa Braxton broke the state indoor record in the triple jump Sunday during the Ocean Breeze Invi- tational, bounding 41-9 3/4. She sailed past the 2001 mark of 41-8 1/2 by New Rochelle's Shenae Dawkins. Her jump was the longest in the country so far this high school season. Braxton was caught off guard by the accomp- lishment because she hadn't realized how close she'd come to the record earlier this season. "I didn't bother to look it up, because I thought it was going to be a 42 or a 43 (feet)," she said. A 'Titan' dies: One of the players immortalized in the movie "Remember The Titans" has died. Julius Campbell, the African-American captain of the team of the first integrated football team in Alexandria, Va., in 1971, died of organ failure. He was 65. The T.C. Williams team finished undefeated and won the Virginia Class 3A state championship at a time of racial tension in suburban Washington, D.C.
"Julius was very, very instrumental on that team at simply getting kids to just talk to one another, kids who never talked to kids from another race their entire lives," Herman Boone, who coached the Titans from 1971 to 1979, told the Washington Post. "By doing so, they learned many things about each other that were not passed down to them and for that, the world owes Julius a debt of gratitude."